The 'Wind of Change' speech, February 1960, and independence for Nigeria, Sierra Leone, Tanzania, Uganda, Kenya, Zambia, Malawi and Zanzibar. The Sharpeville Massacre, March 1960, and apartheid in South Africa. The Berlin Crisis, 1958-1961, and the Cuban Missile Crisis, October 1962. The aftermath of Suez and a new Middle East policy, 1957-1963. The foundation of the EEC by the Treaty of Rome, 1957. 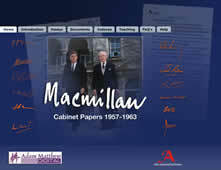 It provides historians and political scientists with direct access to documents from the highest level of Government during the Macmillan Administration. With some 30,000 images of original documents, taken from CAB 128 and CAB 129 as well as selected files from PREM 11 and CAB 124 this project is as important a source for world history as it is for British politics.